The swivel screen on the 60D do you need it? What use is the 60 D flip out screen? Like many SLR users I’d been a bit skeptical about the usefulness of the swivel out screen on the Canon EOS 60D. Having taken the 60D with me on a couple of jobs, I’ve changed my mind and even wondered if we’ll ever see a sufficiently robust one on higher end cameras. 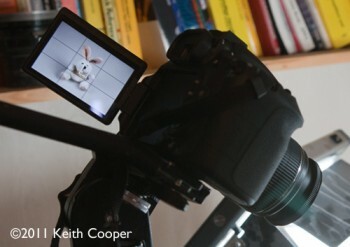 I’ve a small table top continuous lighting setup that I often use for photographing small objects. It’s quick and saves setting up the all the equipment for larger product shoots. Instead of a tripod I use a large studio stand, which allows you to position the camera at the end of a moveable arm. The 60D is attached to this mount and connected to the studio computer (a Mac Pro desktop) via a long USB lead. If I’m pointing the camera down, then with my 1Ds mk3 I can either look at the screen on the back, through the viewfinder (maybe with an angle finder) or use live view and look at the main computer screen. This is no great problem when the camera is easy to get to, but can be a bit precarious if it’s six feet up in the air looking down. The flip out screen is easy to angle, so that I can see immediately what a slight move of the object or lighting looks like. 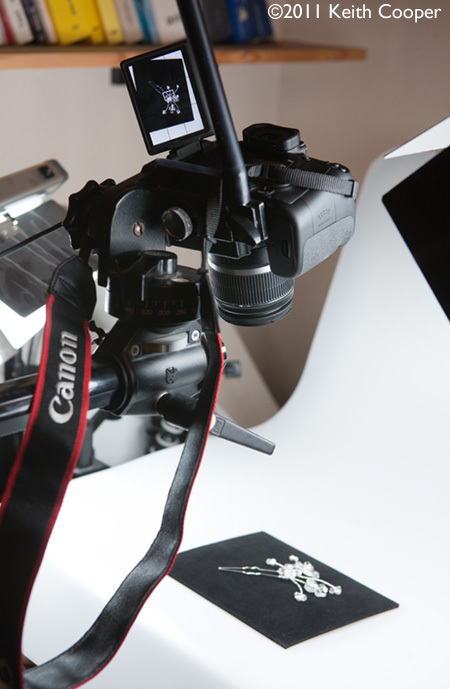 This photo setup gets used more often by my wife Karen, who does quite a lot of jewellery photography as part of her work designing and creating bridal jewellery in the UK. I’d not want to use the kit lens for particularly fine detailed work, even though the latest version of Canon’s DPP software provides very good correction of many lens distortions. If you were using a good macro lens such as the Canon 60mm or 100L then this camera would work well with them. The 18MP sensor of the 60D is capable of more than enough resolution for many product shots, particularly for web use. Since I also teach basic product photography to companies in the UK wanting to do their own photography, I’m quite happy in suggesting that a 60D is worth looking at if they want a bit more than you get with a 600D. I much prefer doing product photography on location, particularly industrial work where the item might weigh several times as much as my car. Sometimes I almost need to get the camera inside equipment to get the details required. Although I’ve a tripod which can be configured with a extendable arm, framing can be a bit hit and miss. If you look at the photos above, you can see that I’ve also enabled grid lines on the display – this helps with alignment if the screen is at an odd angle to where you are viewing from. If you want, you can also use contrast detect AF for focusing on any area of the screen. This is somewhat slower than the phase detection AF system used during normal photography. Ok, so hardly two ‘killer’ uses of the flip out screen, but it reminds me that just because a feature might have originated in consumer cameras doesn’t mean it won’t be of ‘professional use’ too. I remember seeing similar disparaging remarks about the appearance of ‘Liveview’ in pro DSLRs when it appeared.